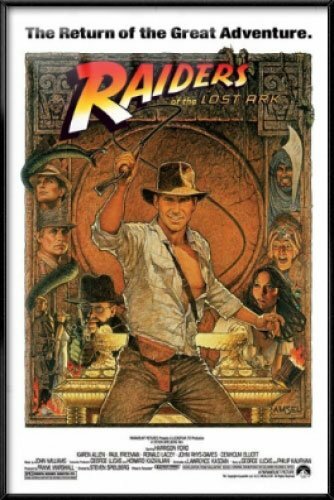 As I was going to Netflix to watch the new season of A Series of Unfortunate Events, I spotted that Raiders of the Lost Ark and the Indiana Jones movies that followed it were now on Netflix and I immediately thought….triple feature! I can remember watching this movie at a special event at school while I was at our junior high. We watched the film on reels in the gym and I was completely mesmerized. Indiana Jones, played by the amazing Harrison Ford, was everything you could have wanted from a hero. He was brave, adventurous, and determined. He brought this adventurer to life like few others could have possibly done. This is perhaps the ultimate collaboration between Steven Spielberg and George Lucas. Throw in an iconic score form John Williams that makes every scene more epic and fills you with that feeling deep down inside. The chemistry between Harrison Ford and Karen Allen was off the charts and, despite being kind of whiny at times, the character if Marion Ravenwood was the perfect pairing with Indiana Jones. The lack of Marion in future films was a drawback. The Nazis make awesome villains as they did in the old serial adventures that this was based on and you can find such a wonderful mixture of exciting action, laugh out loud humor and a cleverness that you can rarely find. There are scenes here that are some of the greatest ever put to film. The moment Indiana Jones shot the swordsman was as perfect as you were going to get (and the idea that this was an improv moment from Harrison Ford that everyone went with is even more epic). The fight on the airplane is one that I will always remember. Harrison Ford adds so much to each scene with a simple facial expression that does a brilliant job of informing about this character. Raiders of the Lost Ark and the character of Indiana Jones are members of the EYG Hall of Fame and it is well deserved. It is one of my personal favorite movies of all time and those people who complain about Indiana Jones not really affecting the plot are just looking for something to complain about. Raiders of the Lost Ark is near perfect.